Life conspires to make gratitude difficult. Things go wrong. Deadlines press. People are irritating. Clients demand the impossible and won’t listen to reason. Drivers on the cellphone paying no attention to traffic cut in ahead of one. In other words, it is easy to get pecked to death by ducks. And behind this day-to-day noise on the line, the possibility of tragedy always lurks. No one with kids feels immune from incipient tragedy. If you’ve ever had the emergency operator break in on the phone line telling you to meet your child’s ambulance at the hospital, or if you’ve ever been told the chance of your child’s survival is in the “low single digits”—and I have had both these experiences—you’ll never again take normal life for granted. But a brush with mortality makes life sweeter. And clearing the field of all the “pecking ducks” by watching a sunset, or taking a walk in nature reminds me of how much there is to be thankful for. I am happy when I remember to be thankful for things large and small: the rush of my kids filling the house with life, a spider web wet with morning dew, and colors in the late afternoon sky. I am grateful that I can be thankful for the gifts I’ve received rather than embittered by the struggle that life is on occasion for all of us. We recently celebrated Nicky’s eleventh birthday. The fedora hat shown in this photo was one of the birthday presents he had requested. I don’t know where he gets his sense of sartorial style—it is probably not from either of his parents. For more images of Nicky, see Nicky and Friend and Nicky is Nine (I seem to have missed number ten!). Resistance takes many guises, and you can read Steven Pressfield’s excellent short book to see many of them defined, and to formulate a game plan for overcoming resistance. Do you know what? Almost everything about my life and work as an artist and photographer is hard. I know resistance. I fight it every day. With this image taken in a slot canyon near Page, Arizona, the act of photography was physically difficult. I had to get to the location, wait for the right weather and maneuver my camera and tripod into position to keep the rig steady for a number of exposures. When I finally had time to get to it, processing took many hours of precision work on my computer. There’s no guarantee that anyone will like—let alone buy—anything I do. My work supports a family of six, so this is a scary thought. Doing my art may be hard, but it is a great gift to me, difficulties and all. I like to say that if it were easy, everyone would do it. True enough. And, in some perverse way, the difficulties of making my art help me keep at it, day after day. I enjoy a challenge. Most of the time I have faith that there is light at the end of the tunnel. What is it about reflections that draw us in? The initial fascination lies with the mirror world aspect of something reflected. Of course, the reflection is mostly like our world—but it differs. The most obvious difference is that something seen reflected—for example, in a mirror—is reversed. The less mirror-like the reflecting surface the more distorted the reflection. For example, when water reflects the reflections merge into refraction. Things beneath the surface come into view and join with our reflected world to create an alternative universe. What started with an interest in reversal becomes quickly charged with exotic differences and the admixture of more than one reality. For a moment, consider some other meanings of “to reflect.” To reflect is to think carefully about something. In psychology, we reflect feelings back to the person originating them. In photography, most subjects reflect light—and the reflected light is the subject of the photo. No wonder that some images with reflections hold our interest. For many photographers a viable strategy is to get the viewer interested with line, color and composition but bring the viewer deeper using reflection. A reflection is our key to enhancing our understanding by looking at our world a little differently, and to thereby know ourselves better as well. One cultural area that Wampler does not mention is the art world, a world that I interact with—particularly in relationship to photography. And, yes, for many “high art” photography galleries if it isn’t ironical in a self-referential way (think Cindy Sherman), it isn’t art. A little bit of satire or irony can be a good thing, but a lot of irony turns genuine feeling to dust. I’m here to tell you it doesn’t have to be that way. Digital technologies have opened an era in which ironic sensibilities can quickly proliferate (as Wampler notes), but these technologies have also given birth to new ways of approaching and creating art. Art that can be approached with the joy of creation, passion and pleasure in the thing itself. Like flowers, waves and surf with its endless ballet on the rocky shore. Down with irony! There are so many reasons that I love to photograph waves. Waves are wild and free. It is hard to predict what a wave is going to do next. A wave can express calmness and excitation simultaneously. The same wave can be both tranquil and violent. Waves are part of a giant pattern, but apart from that pattern: you never know when an individual wave will break in an unpredictable way. Waves remind me of our lives. We are part of a great pattern roaring with the tide to a future that is unknown. Although part of the great pattern, like an individual wave each of us has our own pattern. We each respond in a unique way to the perturbations around us. Day-to-day life can be predictable—with work commitments, school bus stops and all the little things of everyday life—and then wildly unpredictable, changed by exogenous events that might as well be the wind and tide. Life is an adventure, sometimes gentle and calm, sometimes rushing with a roar of foam to crash against the shore. Whether in peak or trough, waves—and our lives—are always in motion. We can hope to enjoy the ride, but we can’t stop the waves or the passage and adventure of life itself. I’ve been asked a great deal about my upcoming workshops. So here’s the current rundown in terms of what’s scheduled through mid-2013. My workshops take considerable amounts of my creative time and attention. So, while I enjoying teaching workshops very much, I try to keep things interesting and full of adventure by avoiding repetition. Therefore, each workshop is a unique event, although there are certainly some locations and themes that bear revisiting. My point is, if you see a workshop that excites you, then carpe diem—register today! 2012.12.08—Photographing Waves Workshop with Harold Davis (Point Reyes Field Institute). This workshop is full. Please call (415) 663.1200 x 373 to be placed on the waiting list. 2013.01.12—HDR (High Dynamic Range) Bootcamp: Full Day Workshop with Harold Davis. Wonder how Harold gets those results, and about the best digital workflow for you? 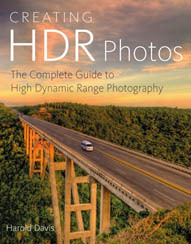 This workshop, by the author of Creating HDR Photos: The Complete Guide to High Dynamic Range Photography (Amphoto/Random House) will answer these questions and open up worlds of creative potential. 2013.03.10—2013.03.15—Photograph Wildflowers in the Anza-Borrego Desert—This workshop is under the sponsorship of Point Reyes Field Institute and is limited to 16 participants. Workshop includes accommodations at the Borrego Sorings Resort & Spa; registration will open on 12.01.2012 by calling (415) 663.1200 x 373 or on the Point Reyes Field Institute website. 2013.08.2—2013.08.05—Dark of the Moon Night & Bristlecone Photography: workshop hosted at Crooked Creek Research Station near the Patriarch Grove and dates have been confirmed; however, it is not yet open for registration, please contact Point Reyes Field Institute at (415) 663.1200 x 373 for more information. Harold’s workshops are often sold-out, and fill up quickly. To avoid disappointment, please register early. Feel free to contact Harold Davis if you have any questions about the workshops! I’m pleased about some recent publications of my work. Ancient Music of the Stars, shown below, illustrates the month of December in the 2013 Nikon World calendar. Click here for my original story about the image, which was shot in the Patriarch Grove of Ancient Bristlecone Pines in eastern California’s White Mountains. Peter Kolonia writes, “Harold Davis’ ethereal floral arrangements have a purity and translucence that borders on spiritual” in a December 2012 Popular Photo Magazine article that features my transparent floral technique, Pure Petals: Make flowers look translucent. Click here for a PDF download of the full article. Finally, my Distant Night Storm in the Patriarch Grove appears as a two-page spread in the HarperCollins UK book Astronomy Photographer of the Year. When it comes to image conception and post-processing these days I seem to be thinking in opposites. In my image of the Triumph of the Wave (below) the breaking surf reforms against the adamant of a rock-bound shore. Wild and peaceful. Violent and tranquil. There’s something like the Hegelian triad in operation: thesis and antithesis yields synthesis. Nowhere is this more apt than in post-production, where effective practice means repetitive application of opposites: sharpening and blurring, increasing contrast and reducing contrast, saturating and desaturating, and so on. The key is to be selective. Blurring and sharpening the same pixel makes no sense because you get back where you started. But blurring and sharpening adjacent pixels can be very effective. Technique should always be in the service of vision. The moving anarchy of the surf is in opposition to the static solidity of the rocks. Synthesis in subject and process can yield an image that is meditative—and a call to action, both calm and exciting. Photography can be many things. I’m here to tell you it is okay to shoot sunsets. Personally, I cannot look at one without being moved, and recognizing the foundation of fables as day turns to night. I was lucky last week to spend a little time photographing at Point Lobos on the coast of California between Carmel and Big Sur. The weather was perfect: raining when I got there but quickly turning to clouds with chiaroscuro lighting effects. There’s little doubt that acre-for-acre Point Lobos is one of the most beautiful places on this green earth. It’s also steeped in the aura of Edward Weston and the West coast school of landscape photography. But Point Lobos can get a bit crowded, and it is sometimes hard for me to concentrate on making serene art when I am tripping over other photographers. So a fringe benefit of the weather was that I had Point Lobos more or less to myself! I am very pleased and excited that Cameron + Company has published a 2013 wall calendar of my black & white photography of California. You can see the cover of the calendar and thumbnails of the interior images below. This over-sized wall calendar retails for $14.99. It can be purchased online from Amazon, from local card and bookstores, or by contacting the publisher. Here’s the video of my Creative Vision and Craft in Digital Photography presentation sponsored by Moab Paper at B&H in New York City. Please let me know what you think, and enjoy!